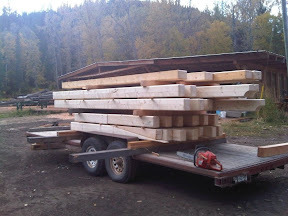 This weekend we are raising the majority of what will be my new office - a square log cabin. 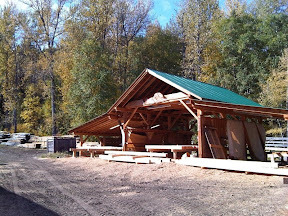 With much help from my cousins at Zirnhelt Timberframes, who formalized my design and milled the logs, we are finally at the build phase of the project. It took us a while to settle on a design and a building technology. It was too easy to add a little here and there, and blow our meager budget. After much advice was sought from many sources, we settled on a small (10'x14') square log (6"x8") cabin. This meant a fairly straightforward assembly with a close-to-completed interior. I was afraid I'd spend a year looking at fiberglass behind vapor barrier otherwise! Though my cousin Damon did most of the milling, I went out to help last weekend. Here's a view of one of their workshops, with three bays. Incidentally, I built (under skilled guidance) the majority of the right bay a few years ago when I spent a week with them to learn about timber framing. 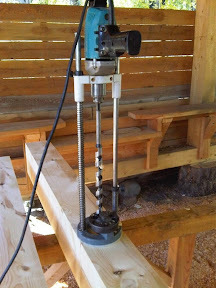 This is what I call a portable drill press. Because the electrical wires have to be run through the logs, we need to make the holes before assembling, and they have to line up perfectly. This tool ensures a plumb hole. 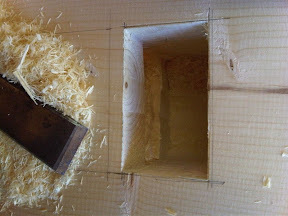 The next part is making the boxes for outlets and switches, and for this we use a mortise tool - imagine a blending of a drill press and a chainsaw. The four rows of spinning teeth are pressed into the wood, and create a nice, clean, square hole. I then used a chisel to clean out some of the wood between the box and the hole I drilled for the cable - this gives the electrician some room to work. 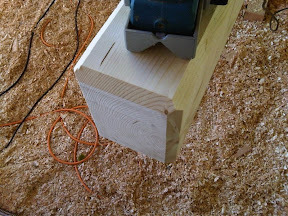 One of my favorite tools is the electric chamfering plane - it removes wood from corners at a 45-degree angle, and really gives it a finished look. We actually did this to make room for the chinking later. I went back tonight to help load the logs onto the trailer for tomorrow's delivery. It doesn't seem like much, but it's all there. 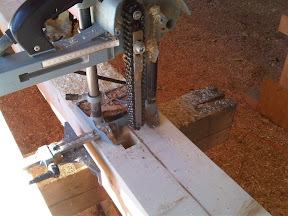 The chainsaw was to cut off the excess lengths on the spacers. I'll share more as we progress.